We are less than one month away from our second tournament of this years trail of 4 kayak tourneys on June 9th at the King Harbor Yacht Club. 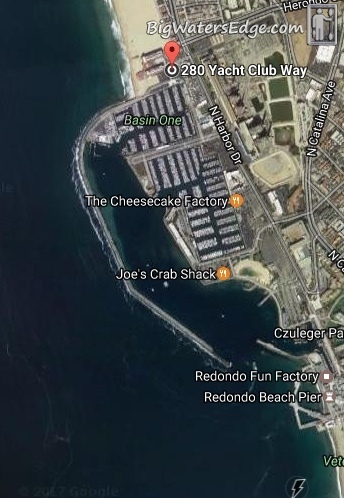 If you or any of your friends would like to participate please have them register at the iAngler site or go to www.battleofthebays.com and they can click on the Santa Monica Bay event to register. The fee is $60 once again and this is a fundraiser for the CCA CAL... this year you can pay with PayPal for the Big Fish side pot and the Mity Might contest....the rockfish division is free although you must use an AHI Live Deception or Assault Jig, or a Squish Rockfish Rig to win the AHI Jig Selection. You can look at the rules and prizes on the webpage to see what this years prizes are looking like. We'll have lunch served by the King Harbor Yacht club again with beer and soft drinks included and we'll have another great raffle again. Primetime Seafood is donating fish again and I'm working with the chef to come up with something delicious and different this year. I'll be sending out some tips and info as we get closer to the event to all the registered anglers...and remember...the All Expense Paid 4 day Cedros Kayak Fishing adventure is a drawing for all registered anglers. You don't even have to catch a fish to win this $2000 trip to Cedros Island in Mexico... it is open to all our anglers. For those of you that have competed before and used the app...GOOD LUCK...! 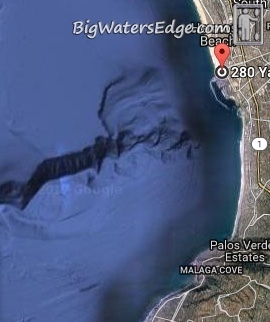 The SM Bay is full of Red Crab, so my advise is to pre-fish and have a few selected spots that you can go to as the different sides of the canyon or the artificial reefs may not bite as you expect on tourney day...I hit 4 spots yesterday before I could find some hungry fish. There is plenty of parking at the yacht club and we can accommodate small kayak trailers too. I'm looking Forward to seeing all of you on June 9th and June 3rd. 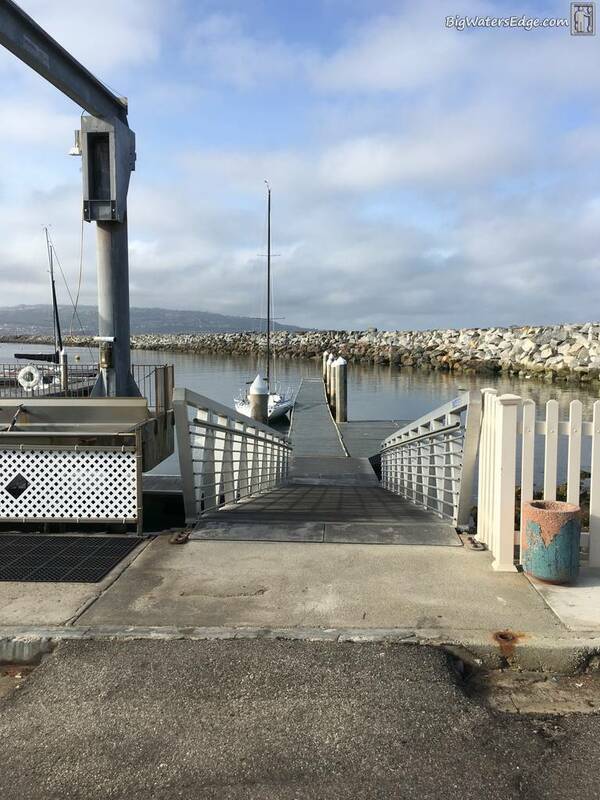 If you choose to fish outside in the Bay...it's a quick 10min peddle to the mouth of the harbor from the north end where the yacht club is. 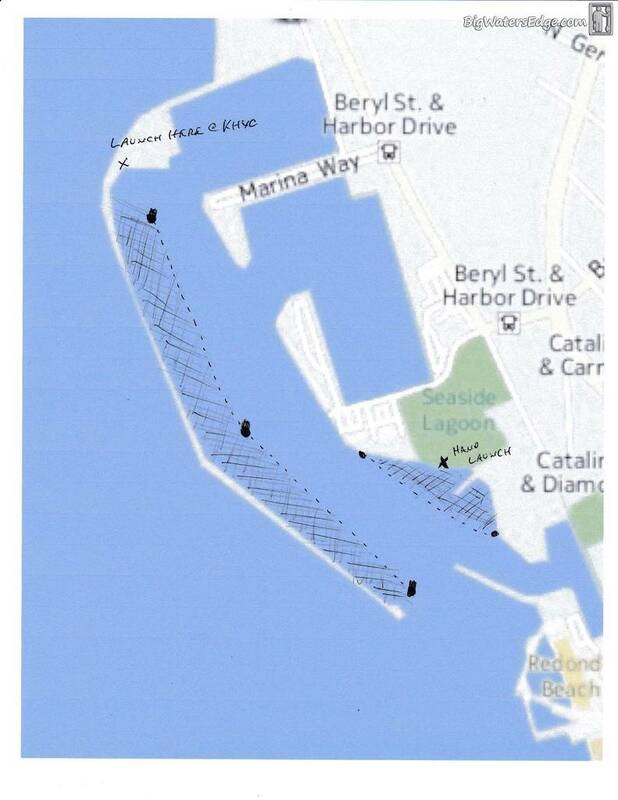 The two shaded areas are the "Harbor Patrol legal" areas to fish inside the harbor...If you desire, you can launch your kayak at the "hand launch" (there is a $2/hr. rate) at the public parking lot. The King Harbor Yacht Club parking is free.